Join us as we Travel Through the Decades at our New Year's Eve celebration. With this exclusive New Year's Eve party all attendees will enjoy drinks (cash bar throughout the night, party favors, laser light show, and a live DJ). 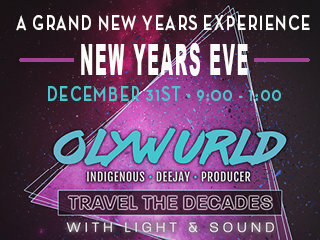 At midnight, all New Year's attendees will enjoy a champagne toast, laser countdown,and balloon drop! New Year's Eve party tickets are $60.00, or make a night of it with a Hotel package for only $350 (includes a standard hotel room along with 2 tickets to the New Year's Party). *Seating at the event is limited as this is a “party atmosphere”. Attendees will be able to leave and re-enter the event throughout the night.